By admin | November 18, 2012. A musical experience took place in Dublin’s O2 arena last Monday when Bon Iver brought their world tour to its conclusion with an emphatic musical display on the Dublin Quays. It is rare that the O2 stage looks small, let alone cramped, but that is exactly what the nine-piece Bon Iver accomplished. And if the nine members were not an impressive enough array, adding to that were the 16 (or more) instruments that the band rotated; suddenly, space became very scarce. The show opened up with Perth – the opening track from the album ‘Bon Iver’. One may have expected a soft, mellow, intimate gig to play out. However, those thoughts were swiftly eradicated when the pounding double bass sent vibrations up every spine via the chair or the ground. And to ensure the sound was colossal there were two drum kits being played simultaneously, because sometimes double bass is not good enough and you need quadruple bass. To add to that there was also a percussionist. The lighting system was phenomenal, as was the stage dressing. A cascade of ragged banners, which had various visuals projected onto them, hung the band. The haphazard manner in which they hung, along with the torn appearance, gave a raw, primal feel. This was the polar opposite to the highly technical lighting display, which ran in perfect unison with the backing of each song. This technique was at its most awe-inspiring during Michicant, when the elaborate lighting-system that resembled candlesticks illuminated in perfect timing with the background chimes. The warm-up act, The Staves, returned to the stage to offer their vocal talents to Justin Vernon – Bon Iver’s lead singer. Prior to the song an over enthusiastic crowd member led to a quip from Justin: “Hey man. For me, take a pill”. Bon Iver also took Blood Bank in a completely new direction by spicing it up with a rock ‘n’ roll vibe and concluding it with a bursting guitar solo from Vernon. The stadium then erupted – nearly as loud as the quadruple bass – when Vernon sat to perform Skinny Love. Beth/Rest concluded the initial part of the show. An overeager Irish crowd screamed, clapped and stomped in encouragement for Bon Iver to return to the stage, so much so that it nearly reverberated the O2 into the River Liffey. Vernon could only respond in true Irish fashion with “Jesus Christ”. Bon Iver returned to play Creature Fear. They then took the entire ambiance of the show to a completely unexpected level by covering Bjork’s Who Is It – including beat box and all. For Emma concluded the encore… but not the show. A second encore occurred, catching many fans by surprise; this led to a massive influx of frantically returning fans. The Wolves brought to an end an extremely entertaining and emotional concert. 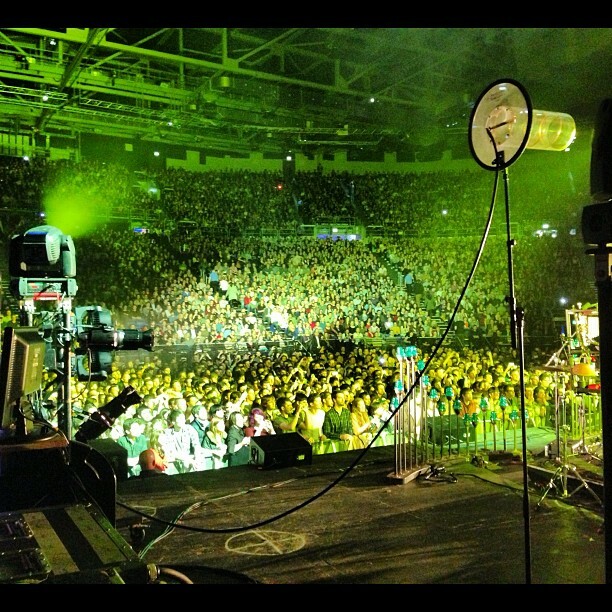 A few hours after the show Bon Iver’s official Twitter account read: “Thank you Dublin. It was emotional”.